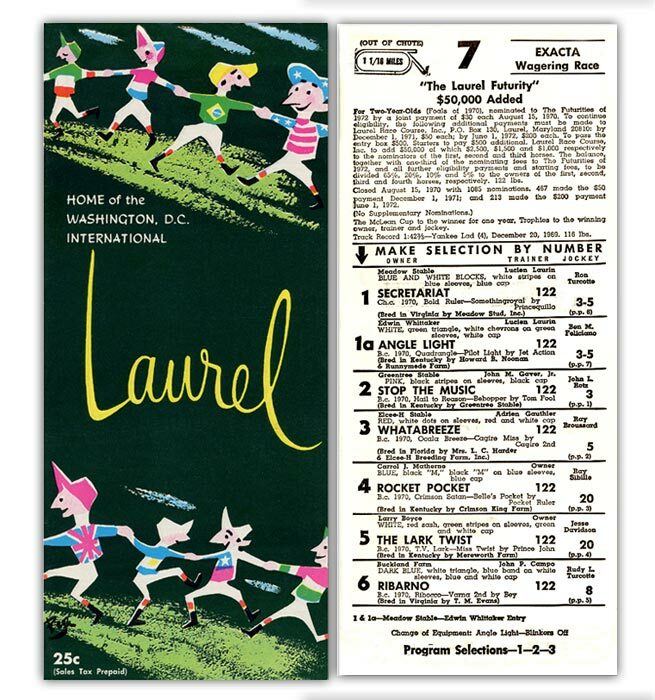 At the end of October the two-year-old spotlight shifted south from New York to Laurel Race Course an important track in the town of Laurel, Md., located in the Maryland countryside between Baltimore and Washington, D.C. The race was the rich Laurel Futurity, which carried a base purse of $50,000, but was elevated in value by “futurity” payments made by owners of top young Thoroughbreds that dramatically increased the prize money. 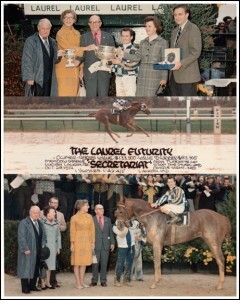 Payoff for first place ended up being $133,300, and Secretariat grabbed it with a flourish. After having his colt disqualified for a bumping incident with Stop the Music in his previous start in New York, jockey Ron Turcotte was taking no chances. The track came up sloppy and Turcotte steered the Secretariat far away from potential close encounters and rolled to an easy 8-length victory. That term, “in hand” refers to the rider’s hands, kept still and steady, with everything in control. Stop the Music ran his usual good race to finish second, with Angle Light a distant third. Despite the off-track, Secretariat’s time for the 1 1/16th miles was an excellent 1:42 4/5 just one fifth of a second off the track record. 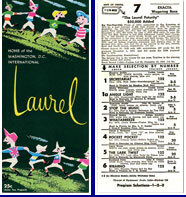 The Laurel Futurity payoffs were the skinniest yet for Secretariat backers. Coupled with Angle Light in the betting Secretariat went off at 1-10, and paid $2.20 to win, $2.10 to place, and $2.10 to show. If you bet $2 across the board on the Meadow Stable entry a total of $6 the return was just $6.40.